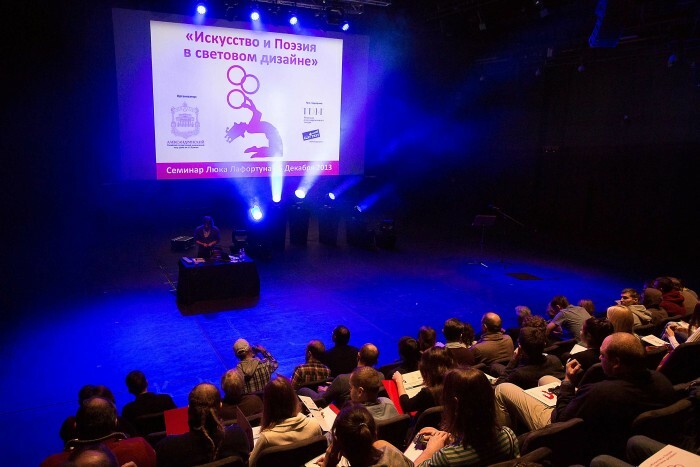 Saint Petersburg, Russia - Luc Lafortune held a lecture of great cultural interest, called "Art and Poetry in Stage Lighting", on 5 December 2013 in Saint Petersburg. This exclusive event was held on the beautiful, modern "New Stage" in the Alexandrinsky Theatre by the theatre's managerial staff itself, with the cooperation of TDM Stage Equipment and the Italian company Clay Paky, the world leader in the production of professional stage lighting equipment. The event media partners were the "Evening Petersburg" newspaper, the main Russian media and state television. Lafortune is considered one of the most creative lighting designers of the last 30 years. He is the author of several prestigious lighting design projects, including the shows of the Cirque du Soleil, the "Turkmenistan Independence Day" celebrations, the musical "The House of the Dancing Water", and Peter Gabriel's "Growing up" tour. His approach to lighting design features elements that are so artistic it is defined as "poetry". It is inspired by a careful philological analysis of the show, which is then combined with a painstaking search for colours and atmospheres. 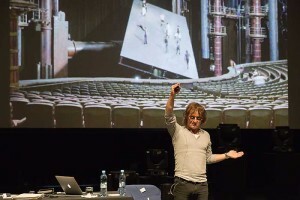 In Saint Petersburg, in front of an audience of professionals and in the country of theatre par excellence, Lafortune spoke about his experiences with the "Cirque du Soleil", where he has had countless opportunities to practice his art and experiment continuously with new technical solutions. Grigori? Borisovich Popov, director of the Alexandrinsky Theatre in Saint Petersburg, said: "We are proud we hosted this prestigious lecture inside one of the theatres that most represents Russian culture. The trade professionals' response was warm and enthusiastic. Lafortune is a true master for all those who work in this field." 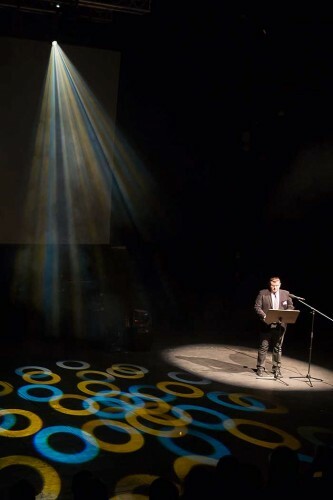 The attendees were particularly interested in Lafortune's experiences, so much so that, at the end of the lecture, they asked numerous questions, which the Canadian lighting designer was happy to answer. "We would like to thank the Alexandrinsky Theatre for having made this event possible, the first of such importance in Russia. We have backed Lafortune in many lectures, and this time - more than ever before - it was essential to cooperate with an experienced and reliable partner on site."